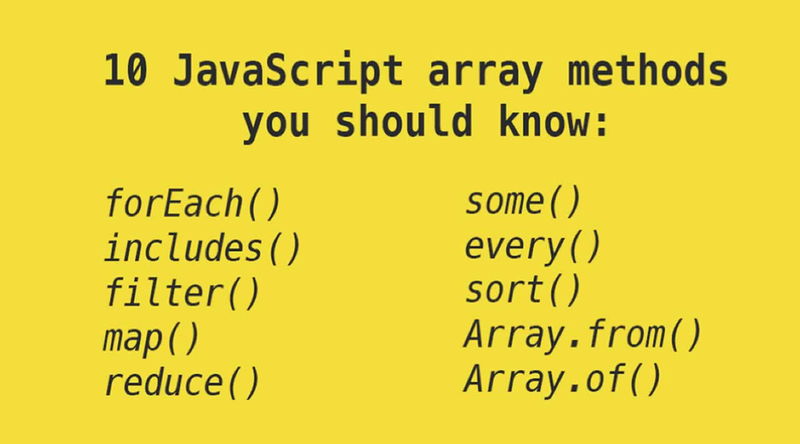 If you know nothing about array, you can click here for array introduction. This method can help you to loop over array’s items. This method check if array includes the item passed in the method. This method create new array with only elements passed condition inside the provided function. This method create new array by calling the provided function in every element. This method check if at least one of array’s item passed the condition. If passed, it return ‘true’ otherwise ‘false’. // at least one element is greater than 4? // at least one element is less than or equal to 0? This method check if all array’s item passed the condition. If passed, it return ‘true’ otherwise ‘false’. This method used to arrange/sort array’s item either ascending or descending order. This change all thing that are array-like or iterable into true array especially when working with DOM, so that you can use other array methods like reduce, map, filter and so on. // I assume that you have created unorder list of items in our html file. This create array from every arguments passed into it. This post is originally published to blog.